Where do I even begin in telling you how blessed and grateful we all are to you? I guess I can begin with why your amazing organization will forever hold a special place in our hearts. The month before my husband’s 2 year death anniversary I began reading and searching online for help with our family’s situation- something that could guide me or give me support in coping with our tragedy. It was during this search where I stumbled upon the Family Lives On Foundation. I began reading about the foundation and smiling at the stories on your website. For the first time I felt a bit of happiness creep back into my heart. To be able to carry on my husband’s Traditions through our children- what an amazing experience! I decided to take the first steps in applying. I was extremely terrified to do this, to be open about our situation to complete strangers, to hear the kids speak of stories of their dad, it still seemed so surreal that any of this even happened. But with a wounded heart and a small glimpse of hope, I decided to move forward and apply for your Tradition Program. This was by far the best decision I could have made. Watching my children Skype with your staff and hearing them talk about wonderful times with their dad, seeing them smile, laugh, and shed a few tears, watching them get so excited about receiving their packages and watching them smile from ear to ear as they opened them, made me realize that my husband left behind one of the most precious gifts he could have left- his Traditions. Thank you Isis and the Family Lives On Foundation for making all of this possible. For realizing that although the death of a parent can leave an enormous gaping hole in the heart of a child, a gaping hole that will remain there forever, that there is still room to experience moments of happiness and joy, and to keep celebrating the life and Traditions of our loved one. 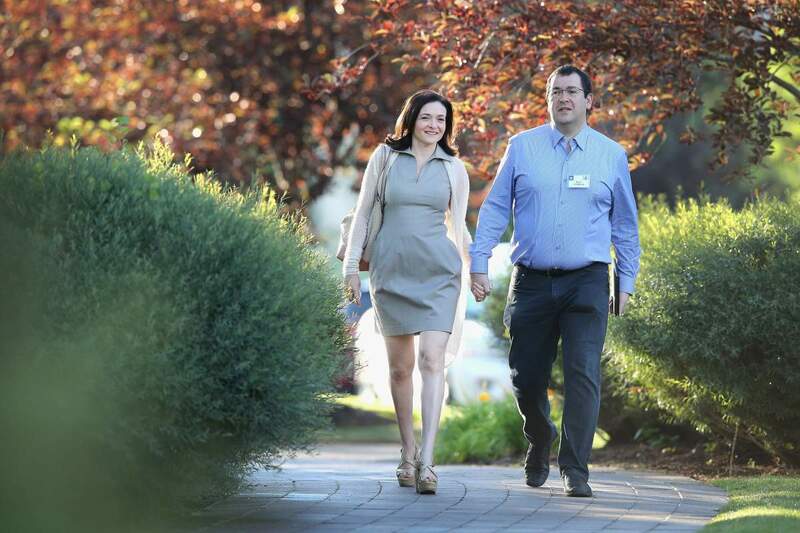 And thank you to my remarkable husband Mike. 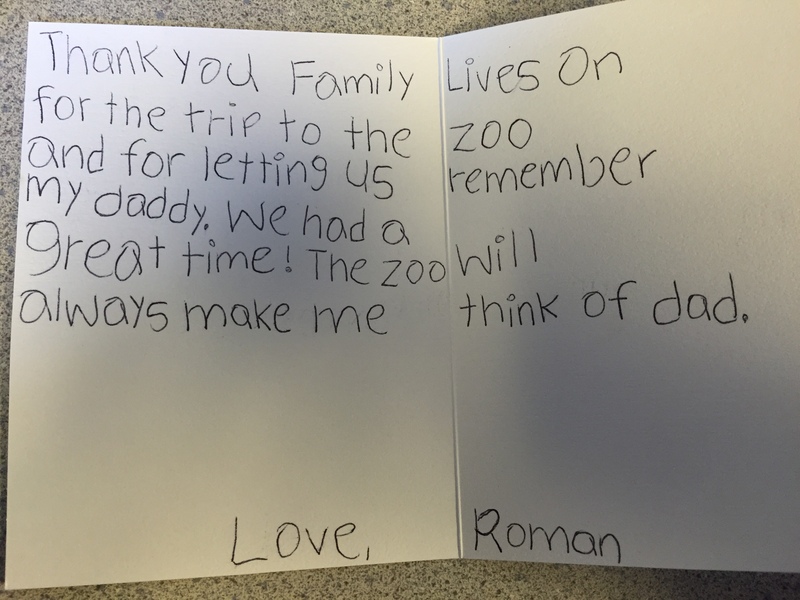 Thank you for the trips to the zoo, the summers at the river, the BBQ’s at home, and the weekend adventures to the movies and the park. Thank you for always keeping us a family and for instilling in us these family Traditions. Because of you and the Traditions and memories we made together, we can now keep them going and pass them on and forever keep your memory alive. This is why Family Lives On Foundation supports the lifelong emotional wellbeing of children and teens whose mother or father has died. The organization also offers education programs to raise awareness of the impact of grief and loss on a child. Honoring the past, celebrating the present and building the future. “An important part of grief is finding ways to continue a relationship with the person who has died even though they are no longer fully present. We have written quite a bit on continuing bonds with deceased loved ones and we believe this is an important part of grieving. A remarkable post by the very talented writers at What’s Your Grief about the profound influence adults have on the ways in which children learn to cope with their grief. 11. Metastatic breast cancer is not an automatic death sentence. Although most people will ultimately die of their disease, some will live for many years. 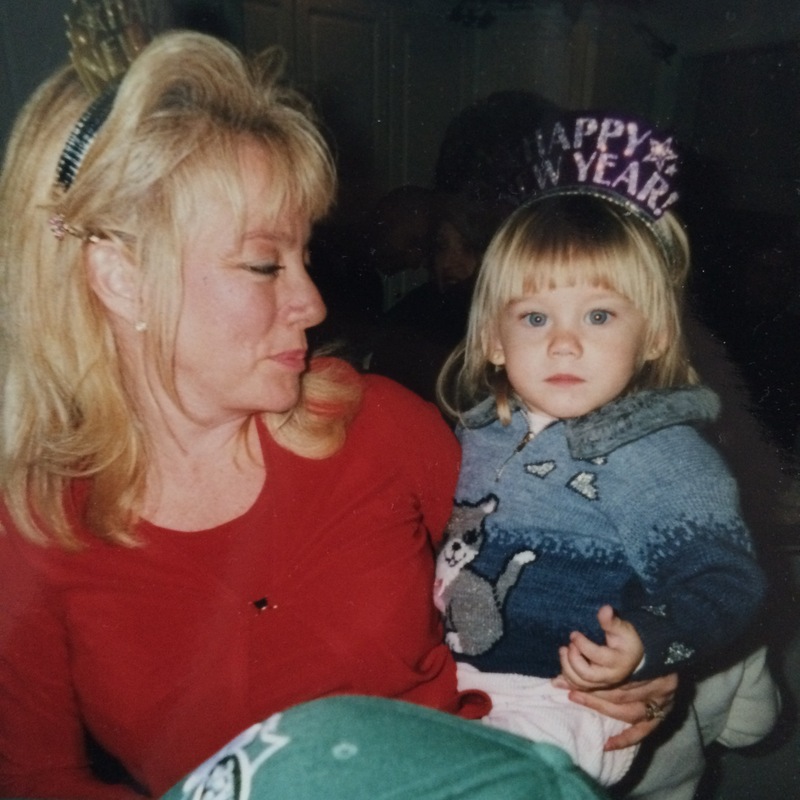 A letter to tackle different aspects of losing a parent. First off, I just wanted to start by saying you are strong, even when it feels like the world is crumbling beneath your feet. Secondly, I wanted to say how sorry I am for the loss of your parent in your most crucial years of needing love and words of encouragement. A piece of your world was stripped away from you, and that will never be replaced. Which I know personally, stings so deep. As you continue to grow throughout your life, I wanted to address some aspects that I have learned on my own are not the easiest to conquer; that in most cases people do not understand. 1. It’s okay to cry, on the real: Forget those people who tell you crying is for the weak. You go ahead and cry; you probably need it. 2.Every holiday is like ripping a Band-Aid off over and over: Your family will laugh about memories from the past when everyone was all together. Reminiscing what your parent was like, their favorite desserts, or how they would laugh a certain way. With a smile plastered across your face, you’ll nod as family members tell you stories and you’ll think about what you would give to have them there with you. 3. 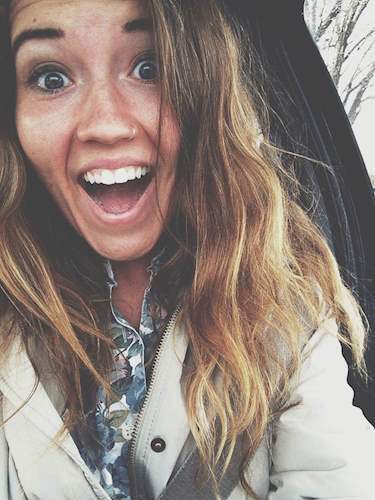 Graduating, moving away to college, first date, first real job, any big event will cause a sting of pain: In the moment, you are so happy and excited as these new chapters open up. But later on, once alone, you think about how awesome it would be to have them carrying boxes into your dorm room, questioning your first date, looking out into the crowd at graduation, and seeing them with a camera recording you with a thumbs up. You’ll get chills as you think about how different life would be with them around. 4. You question everything and ask over and over why? : Whether it was a natural cause of death or some accident, you question everything you know and what you believe in (if you believe in anything). You will replay moments in your head questioning your actions asking what if? But if anything, the re-occuring question is why? An answer that is one to be continued. 5. You will be jealous of kids who have both their parents: You will see kids who have both parents and something inside you will stir; a sense of resentment. Because at one time; that was you and the world wasn’t perfect but it was lovely and everything you knew was great. 6. Watching your other parent heal is one of the hardest things you will ever watch: Though extremely challenging and frustrating at times, watching your parent cry to the point of exhaustion will be really hard, but the grieving process does get easier. So hang onto that small nugget of gold. 7. Family traditions will never be the same: Summers of camping and spending endless days on the water, baking rum cakes together, Saturday mornings spent watching cartoons just become a memory that you hold so close to your heart. 8. You become extremely protective of your siblings and whoever makes fun of them for losing a parent: No one messes with your squad but especially when someone brings up how you lost your parent; you go into protective mode. Just remember to breathe and walk in love. Kill ’em with kindness. 10. The word “sorry” becomes numb to you: People don’t know your story and openly they don’t know what to do besides say sorry. After awhile, you smirk and softly whisper, “Thanks.” The word sorry no longer has meaning after you have heard it over a million times. 11. Pictures and old family videos are possibly one of God’s greatest gift to you: One day you will come across a tub filled with pictures, and as you sit on the basement floor looking through them, you’ll start to cry. Your mind will take you back to that exact moment and right there alone on the cold floor, you encounter a special moment of what life was like then. 12. Death will change you and your outlook on life: Seemingly the small stuff isn’t so bad anymore. You stop complaining and you really take a check of what is important in your life. 14. Hearing old stories from relatives and friends is a great thing: Shocked and trying not to laugh, you can’t believe what your uncle just told you about the one night they all snuck out and crashed a car. These stories will warm your heart, take the time to listen to them. 15. Lastly, you grow in ways you never thought possible: There will be moments where your whole family will be together and you’ll think to yourself how in a weird way everyone has a quirk of that parent. Then looking at your own heart, you realize how much you’ve grown. As you continue to grow, just remember wherever you are in life, that parent is right there with you, cheering you on and flashing you thumbs up as you graduate throughout the stages of life. It’s Not My Story to Tell, Not Really. It’s not my story to tell, not really. Yet, I know that if I don’t tell it, many of you will never hear it and it’s a story worth hearing. Today, I met a little girl dressed for summer in all white with a beautiful braid in her hair. She had the biggest brown eyes I have ever seen and with her friends she was a sassy in the know leader of her group. So, it came as a bit of shock when we worked in small groups that this child with her street smart airs refused to put anything but two feathers on a blank piece of paper. And she refused to talk to me. She just kept looking at her paper and then looking up at me with those brown eyes swimming with tears. I didn’t push, I didn’t call her out, it was her paper after all. And we had asked the kids to put a memory on the paper, a memory of the person who had died – basically to tell us a story about their person that they could choose to share or not. It was her paper and her story, but I couldn’t figure out why it was blank. As the kids scrambled out of the room and on to the next activity, I asked this child if she would stay with me for moment. The room seemed to expand so that this child and I inhabited a tiny pocket of safety within the walls of the room and in this safe zone, the little girl explained something important to me. “My daddy died when I was two. I didn’t know him. I don’t know nothin’ ’bout him. I know he’s dead. He gets two feathers for being an angel and that’s all he gets. Some days I think he must have been good and some days I think he must have been bad. It’s not my story to tell and it’s not our job to fill in the blank page for a child when maybe that page is blank for a reason. 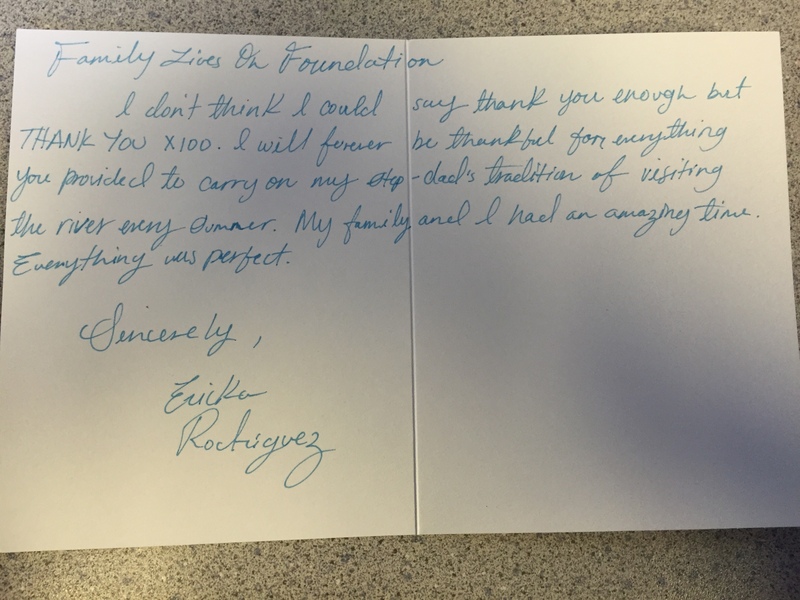 DONATE The Tradition Program is entirely funded through charitable donations and services are provided at no cost to the families. Family Lives On Foundation is a 501(c)(3) nonprofit organization. If you would like to help support the grieving children and families we serve, please donate here. The Tradition Program isn’t therapy but it is therapeutic. Here’s how it works. Why she can come up with such profound advice on the spot- she’s an educator! Dr. Heidi Hayes Jacobs is an author and internationally recognized education leader known for her work in curriculum mapping, curriculum integration, and developing 21st century approaches to teaching and learning. HONY is all about stories. As a community, let’s try to ‘like’ comments from people sharing insights or similar experiences. There is nothing wrong with comments like ‘her hair is awesome,’ or ‘she looks much younger than 50.’ Those comments are kind, supportive, and appreciated. But I think it would make Humans of New York more interesting if we could work together to prioritize stories over opinions. If there’s anything I’ve learned from doing HONY these past five years, it’s that stories are always more interesting than opinions. Brooke Truax Her words are poetically beautiful and deep. However, after I read them, I couldn’t help but think: “Just keep swimming, just keep swimming…” I blame Dori. Rebecca Quinn What she said reminds me of a quote from Kafka on the Shore by Haruki Murakami. Kim O’Grady Simensen Anyone that has ever done much Pacific Coast body surfing knows that when you dive UNDER the wave (“go deep), you can minimize the turbulence and lessen the power of the wave that can easily throw you head first into the sand. I like the metaphor for troubled times and the advice of transformation. The challenge can be finding the strength to go to those uncomfortable and scary places. Although body surfing is a solo support, living is not. I wish the author had reminded us to surround yourself with friends and love – that also brings strength and lessens the power of negative forces in our life. Seek Joy! Re-posted from TIME’s weekly parenting newsletter. All the fun, none of the scolding. All parents want their kids to be happy. I mean, obviously. But for most of history in most of the world that has meant keeping them from hunger and death and physical bodily harm. What happens when those threats aren’t quite so looming? 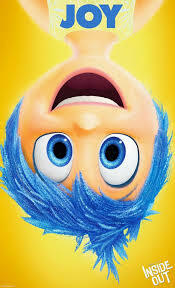 Pixar’s new movie is an examination of our modern obsession with keeping our kids in a permanent state of delight. One note of warning. Some people have labeled the movie PMCIFOTC. (Parents May Cry In Front Of Their Children.) Adults should be accompanied by an understanding minor. Read the entire review here. “When you are in a fearful state, everything is imbued with threat and uncertainty and peril,” Keltner says. And when Riley is sad, he says, even her happy memories take on a bluish hue. 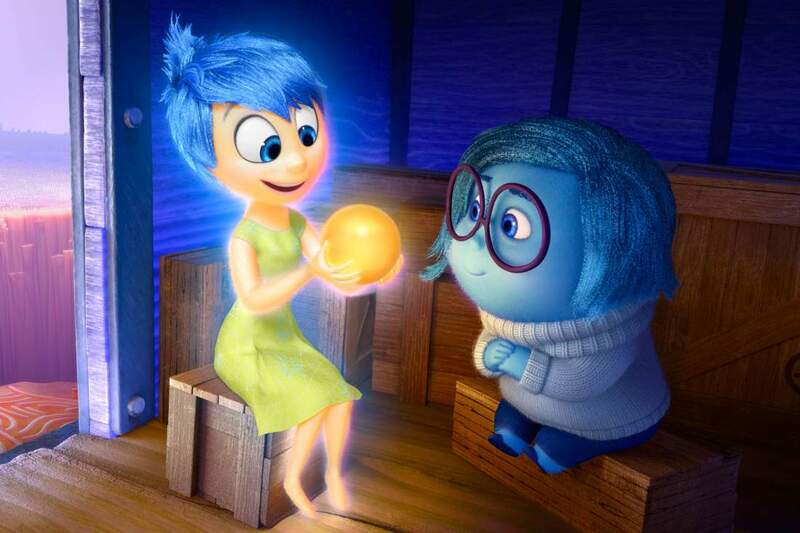 Joy (left, voiced by Amy Poehler) and Sadness (voiced by Phyllis Smith) catch a ride on the Train of Thought in Pixar’s Inside Out. The movie opens in theaters nationwide June 19. 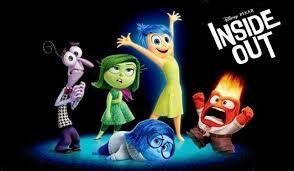 One of the film’s high points, though, is its depiction of sadness, Keltner says. 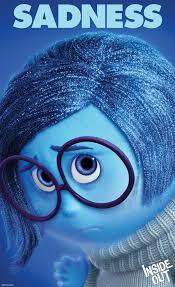 In many books and movies for kids, he says, sadness is dismissed as a negative emotion with no important role. 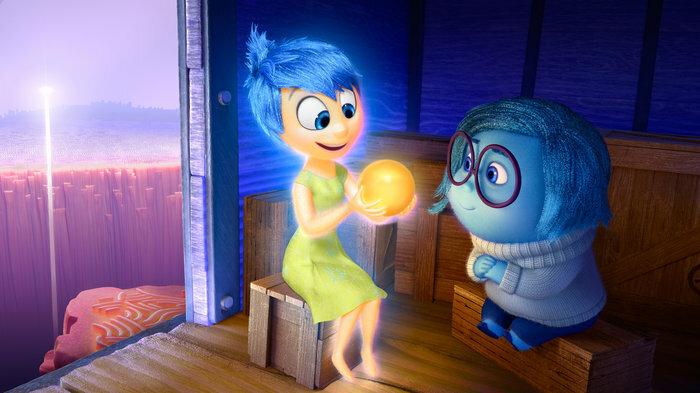 In Inside Out, star-shaped Joy gets more screen time. But when the emotions are in danger of getting lost in the endless corridors of long-term memory, it is Sadness, downcast and shaped like a blue teardrop, who emerges as an unlikely heroine. We all have emotions, little voices inside our head. I can’t wait until June 19th to meet the emotions inside someone else’s head! http://www.npr.org/player/embed/413980258/414149726” target=”_blank”>Listen to full NPR review here. Celebrate Father’s Day by supporting children and teens whose mother or father has died. 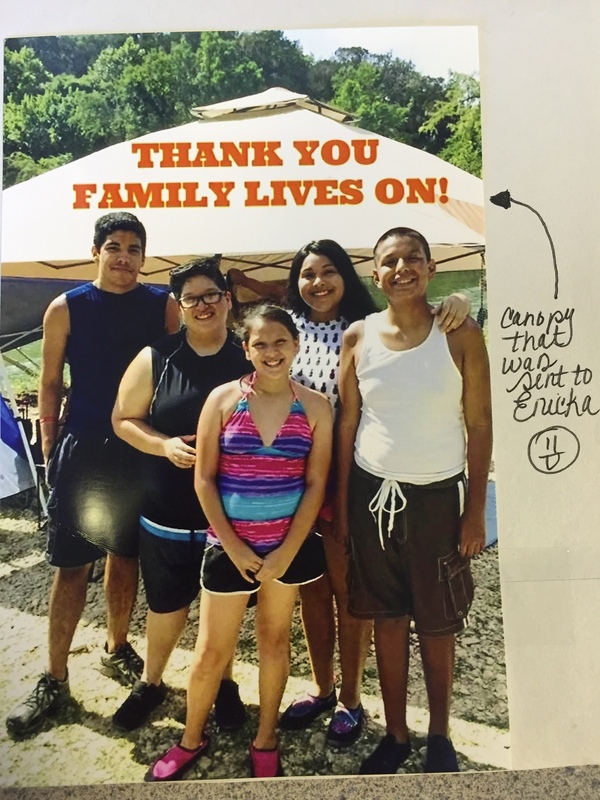 DONATE Family Lives On Foundation is a 501(c)(3) nonprofit organization entirely funded through charitable donations. Our services are provided at no cost to the families. If you would like to help, please donate here. 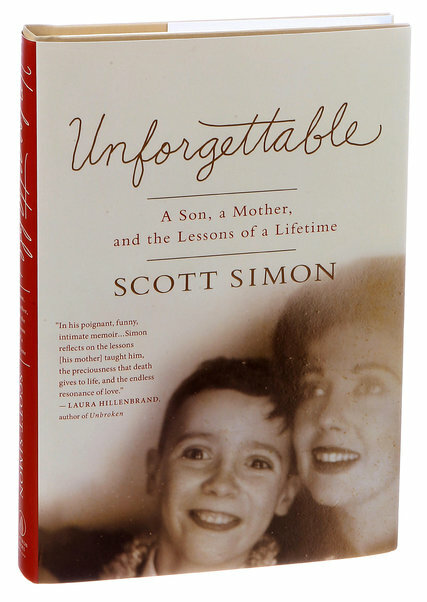 Unforgettable: A Son, a Mother, and the Lessons of a Lifetime. Our children want to know if you’re dead forever. I tell them yes. But I wonder about that too. Death makes life worthwhile. It gives each moment meaning. I hope I live to one hundred and fifty, and that our daughters can make it to at least two hundred. But death drives life. It frightens and inspires us. Do away with death, and we’d have no reason to get out of bed (or into it), grow, work, or love. Why would we do much of anything if we had the time for everything? It’s the certainty of death that moves us to sing and write poems, find friends, and sail across oceans and skies. It’s because we know that we don’t have all the time in the world that we try to use the uncertain and unknowable time that we have to do something that endures. Death is sad, grim, unwelcome and invaluable. But it’s why we try to make something of life. It’s why we have children. I don’t know what becomes of us when we die. But I believe I will go on to a place (which will probably look a lot like Chicago and Normandy) where I’ll find my mother and my father, my stepfather, and all of our beloved cats, dogs, horses, turtles and fish who predecease me. I’ll get to take a walk with Gandhi, have a glass of D’Yquem with Mr. Jefferson, and a glass of just about anything with Sir Winston. I’ll get together over tea and an asp with Cleopatra. I’ll have a catch with Jackie Robinson (and hope that celestial climes improve my infield skills). I believe that I’ll get to look out over the world and behold my daughters. They’ll feel my love, hearten to hear my gentle instruction, and miss me; but not so much that they won’t spend most of their time giggling and enjoying life in full measure. In time, I believe I’ll be reunited with my fabulously kind and beautiful wife, even if she runs away with a Hollywood star or an Italian race car driver as soon as my ashes cool. I will count on heavenly powers of understanding to look down at her happiness and nobly smile, and if they expect to be with her, too, I rely on God to work that out. I do not know if God will reveal Him, Her, or Itself to me as a craggy old African man with a long white beard, or a mature, Rubenesque woman barely concealed by clouds, or as some kind of mollusk. I am undecided on the essential questions that can make theologians stammer: if there is a God, how does He or She or It let little children suffer? What kind of Heaven can there be if innocents have to share it with scoundrels? Do gnats have souls? My vision of the hereafter has no scientific, religious or even much mythical foundation. But I just can’t get by, day after day, thinking that we go on to nothing when we’re done here, and never again see those we love. I don’t worry about being right. I just want to wrap myself in a belief that gets me through the long nights of life. I am getting a life’s lesson about grace from my mother in the ICU. We never stop learning from our mothers, do we? Change societal norms, give grief words. DONATE Family Lives On Foundation is a 501(c)(3) nonprofit organization entirely funded through charitable donations. Our services are provided at no cost to the families. If you would like to help support the grieving children and families we serve,please donate here. I have learned that I never really knew what to say to others in need. I think I got this all wrong before; I tried to assure people that it would be okay, thinking that hope was the most comforting thing I could offer. A friend of mine with late-stage cancer told me that the worst thing people could say to him was “It is going to be okay.” That voice in his head would scream, How do you know it is going to be okay? Do you not understand that I might die? I learned this past month what he was trying to teach me. Real empathy is sometimes not insisting that it will be okay but acknowledging that it is not. When people say to me, “You and your children will find happiness again,” my heart tells me, Yes, I believe that, but I know I will never feel pure joy again. Those who have said, “You will find a new normal, but it will never be as good” comfort me more because they know and speak the truth. Even a simple “How are you?”—almost always asked with the best of intentions—is better replaced with “How are you today?” When I am asked “How are you?” I stop myself from shouting, My husband died a month ago, how do you think I am? When I hear “How are you today?” I realize the person knows that the best I can do right now is to get through each day. Survival mode. One day at a time. Most surviving spouses refer to this as the “numb phase”. Some can’t remember entire weeks or months during this time. Or, paramount to sadness can often be the very real feeling of suffocating, so powerful overwhelmed with the day to day challenges of living. Most families are dual income, the death of a spouse means the surviving parent inherits double the financial responsibilities, the household maintenance, the carpool, the parental duties – all the while navigating their own grief. I have learned to ask for help—and I have learned how much help I need. We hope you, and anyone parenting a child or teen whose mother or father has died, will enroll in the Tradition Program. It isn’t therapy but it IS therapeutic based on clinically identified needs for healthy bereavement. Read more about the Tradition Program HERE. 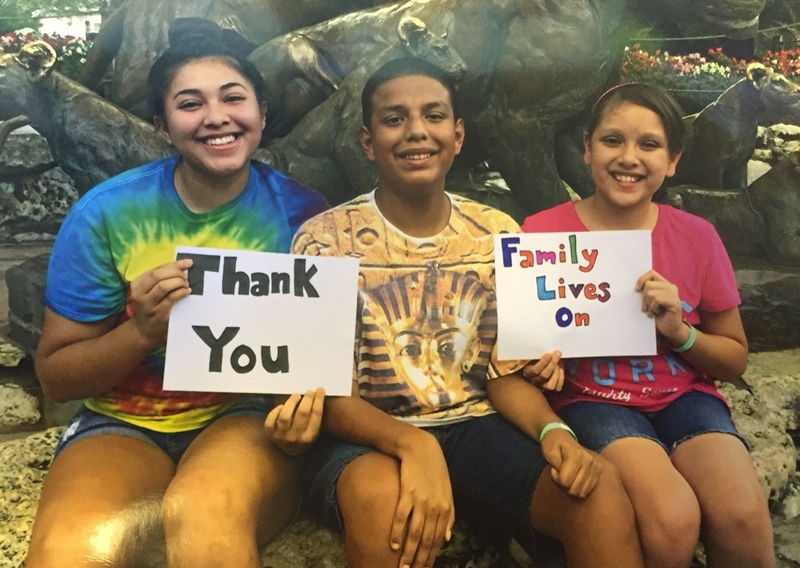 On behalf of all the children and teens whose mother or father has died, thank you, Family Lives On Foundation. PAY IT FORWARD – DONATE! Family Lives On Foundation is a 501(c)(3) nonprofit organization entirely funded through charitable donations. Our services are provided at no cost to the families. If you would like to help support the grieving children and families we serve, please donate here. More than two million children in the United States are grieving the death of a parent. “When a student’s relative or loved one has died, teachers wonder, perhaps worry, what do I say? Out of our own personal discomfort, or with good intentions, they often say nothing at all,” said Christine Cavalieri, executive director of the Family Lives On Foundation. “Saying nothing says a lot, particularly to a child who has experienced the death of a parent,” she continued. Studies have shown that bereaved children are between two and three times more likely to experience mental health issues such as anxiety and depression. As they grow up, they’re also more likely to engage in high-risk behavior and have criminal records. However, these risks can be lessened when children and teens maintain an emotional connection to their late parent. Finding healthy ways to adapt to loss is key to providing bereavement support. Cavalieri said that people’s discomfort with grief makes them attempt to ignore it and hope it will pass quickly. As a result, families — especially children — often suffer alone and in silence without sufficient understanding and support of relatives and teachers. Family Lives On serves children and teens ages three to 18, regardless of race, gender, religion, socioeconomic status or cause of the parent’s death. 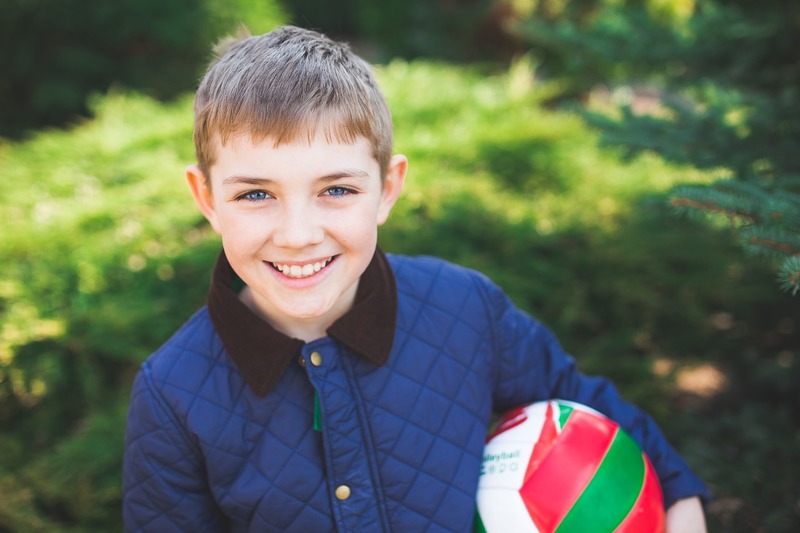 The non-profit organization supports the lifelong emotional well-being of children and teens whose mother or father has died and is entirely funded through charitable donations. Grounded in research and clinically-identified needs for healthy bereavement, Family Lives On’s Tradition Program makes it possible for children to continue activities or celebrate traditions that they used to do with their mother or father. Cavalieri said that educators should understand how family traditions provide a natural context for communication and connection, and help children to maintain a healthy emotional bond. “Celebrating the life story is a powerful holistic approach that focuses on moving forward and the future. It isn’t therapy but it is therapeutic,” she said. For comprehensive resources to assist students coping with parental loss, Cavalieri recommends the Coalition to Support Grieving Children. Both national teachers’ unions are members of the coalition. YOU CAN HELP! 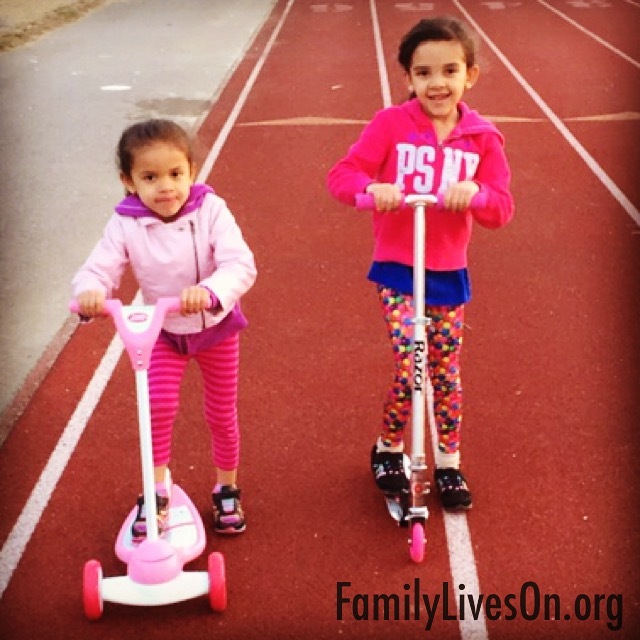 Family Lives On Foundation is a 501(c)(3) nonprofit organization entirely funded through charitable donations. Our services are provided at no cost to the families. If you would like to help support the grieving children and families we serve, please donate here. This, too funny, and absolutely accurate, post elicited more than one chuckle. Reality: The kids sprint through the exhibits, tell you it’s boring, but pop a squat for over 20 minutes at the T-Rex exhibit because they like the fake blood. Lunch consists of overpriced hot dogs and chips. Mom’s Fantasy: We’ll take a relaxing walk down by the beach, look for shells and watch the sunset. Reality: Your son picks up a condom, your daughter steps on a large stick and now they are both ridiculously hangry, so you leave before sunset. It’s also the simple, seeming mundane, every day things that children and teens miss most. The death of a parent changes everything. Children go through so many developmental stages and it is important for the adults in their lives to understand, and remember, that it is a life-long process of adapting to the death of their mother or father. Family Lives On supports hundreds of grieving children and teens by helping them continue traditions they used to do with their Mom or Dad. Traditions provide a more natural context for intra-family communication and connection as well as giving permission and encouragement to go on living even after a parent has died. DONATE Family Lives On Foundation is a 501(c)(3) nonprofit organization entirely funded through charitable donations. Our services are provided at no cost to the families. If you would like to help support the grieving children and families we serve, please donate here. When I was 17 I lost my dad unexpectedly. It’s been seven years and the pain is still very real. Over the course of those years I have come to realize many things that I feel need to be shared with others. I know there are many other young women who are in my shoes. To our friends, these are the things we want you to know. We are sorry for being quiet every time you talk about your dad to us. We don’t mean to sound uninterested or make you feel that your happiness is unimportant to us. 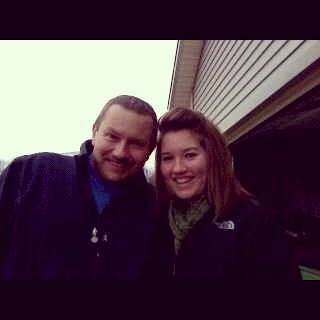 It’s just that when you talk about moments with your dad, it takes us back to moments with ours. Moments we wish we could relive and share with you, too. We don’t get quiet on purpose; it kind of just happens. It’s our mind’s way of protecting us from bursting out in tears. A trifecta of challenging conversations adults have with children is the topic of a recent episode of This American Life: Birds & Bees. I found the entire podcast thought-provoking, particularly the discussion of racism and discrimination. But the purpose of this blog post is to focus on the final section (from the 40 minute mark) on death. To listen to the entire podcast, use this link. Nancy says children just grieve differently than adults, especially little children. They grieve in fits and starts. They can’t focus on it for very long. And grief is more physical for them. They’ll act out their anger, maybe kick a door, which is the reason for the volcano room at The Sharing Place. They might also regress, suddenly using baby talk or sucking their thumbs. And if they’re potty trained, they might become untrained. They’re also magical thinkers. I heard stories of kids who were afraid to go to sleep because grandma went to sleep and didn’t wake up. One little boy wandered away from his mom at the emergency room saying, I’m looking for Dad. We left him here last time. Another boy said he just wanted to die for a few days so he can go to heaven and teach his little sister how to ride a tricycle. Children also re-grieve. That is, with every new stage of development, they experience their grief anew. And with every milestone– when their braces come off, when they get their driver’s license, when they graduate– they’ll inevitably think, I wish my mom was here. And given all of this, the thought behind The Sharing Place and other centers like it is that kids can help one another in a way that adults perhaps can’t help them. That’s why they’re brought together in these groups. In short, kids speak the same language. To listen to the entire podcast, use this link. The Sharing Place is one of many grief support centers available nationwide, to locate support near you, please visit the National Alliance for Grieving Children. Family Lives On supports the lifelong emotional wellbeing of children and teens whose mother or father has died. Available anywhere in the United States, Family Lives On serves all children & teens ages 3-18, regardless of race, gender, religion, socioeconomic status or cause of parent’s death. The Tradition Program isn’t therapy but it is therapeutic. Here’s how it works. If you know a family whose mother or father has died, please encourage them to enroll here. Before he died, Eliana and Emma’s Dad would often take them to a nearby high school so they could all ride together. Sometimes they would play tennis, too. To make sure they had lots of energy, they would pack a small bag with cheese and crackers, and some water, to refuel. What did your family enjoy the most about the Tradition program? Family Lives On supports the lifelong emotional wellbeing of children and teens whose mother or father has died. Available anywhere in the United States, Family Lives On serves all children & teens ages 3-18, regardless of race, gender, religion, socioeconomic status or cause of parent’s death. The Tradition Program is grounded in research and a number of clinically identified needs in bereaved children. Here’s how it works. People who can sense the sorrow behind your smile, the love behind your anger, and the meaning behind your silence are your true friends in life. Reposting this from The Dougy Center who included this introductory paragraph: “In this courageously honest story, Matthew Teague shares his struggle in caring for his dying wife, Nicole, and for their two young daughters. Not knowing what is in store, his friend, Dane, offers him a profound and unexpected gift: both his emotional and physical presence. Matthew and Dane’s friendship is an inspiring example of choosing to be present with one another in the most dire of circumstances. Warning: Please be advised that the imagery content and language of this article is graphic and may arouse an emotional response. Later that year, I remember him standing sentry at the hospital. He had driven from New Orleans—we were living in a small town called Fairhope, Alabama—to stand guard for hours in the hallway outside Nicole’s room so that she could sleep. One afternoon, a group of church ladies arrived. There is no force under heaven as mighty as a band of middle-aged Baptist ladies, and from inside the room we could hear Dane wage a battle of kind intentions. “Well, we came by to pray for them,” one of the ladies said.